Consumer purchase behaviors are incurring a titanic shift. Consumers are more informed, connected and empowered than ever and they know they have options as alternatives are only a click away. Unfortunately, too many retailers are sluggish in adopting the retail strategies and supporting technologies to meet and accommodate consumers. They fail to understand that these strategies and technologies are not fads, will eventually be adopted if they expect to compete and that every day that passes without adoption contributes to lost sales and customer churn. Meeting consumers where they search, communicate, evaluate and buy, accommodating their communication and purchase preferences, and using data to foster and grow customer relationships is an undeniable mandate for retailers. However, retailers face a daunting challenge in terms of understanding which new retail strategies offer the biggest payback. It's a multifaceted challenge because none of the retail strategies are fully exploited autonomously. Research and market leaders clearly show us that only when an integrated mix of retail strategies are orchestrated in an end to end fashion will retailers effectively respond to customer preferences, outperform their competitors, lower their information systems total cost of ownership (TCO) and grow company revenues. 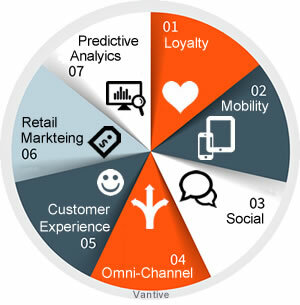 In this article I've combined the 7 highest impact retail strategies – which include loyalty, mobility, social, omni-channel, Customer Experience, retail marketing and predictive analytics – into an end to end retail framework that tightly links customer and revenue objectives with enabling technologies. This is a holistic approach that has worked for me with many retail clients and I hope may work for you, or at least stimulate your thinking. These retail strategies and enabling technologies are clearly the future for retailers. Retailers face a daunting challenge in terms of understanding which new retail strategies offer the biggest payback. It's a multifaceted challenge because none of the retail strategies are fully exploited autonomously.